In 2009, Ms. González's youngest daughter, Isabel González Whitaker, worked with engaged neighbors, the City of Atlanta, civic and city leaders including Atlanta City Council President Felicia A. Moore and Chairman of the Board of Commissioners of Fulton County Robb Pitts to rename Coronet Way Park—a small, austere playground/park in a culturally diverse neighborhood and walking distance from where her mother had lived for 30 years. The park would be renamed after her mother and established to honor themes of family, community, diversity, inclusiveness and tolerance. Isabel at the park before the renaming, 2010. With support from Ralph de la Vega, the Vice Chairman of AT&T, Park Pride, her family, park neighbors, and community leaders the park was officially renamed in 2009, and the Friends of Sara J. González Park was established through Park Pride, the premiere Atlanta parks improvement organization and operating 501(c)3. Since 2010, Isabel has led annual clean ups and plantings with family, neighbors and the community. In 2017, the Friends of Sara J. González Park received a significant endowment from EDENS, the real estate developer of the new Moores Mill Center and Publix Super Market on Bolton Road. That same year, Ms. González Whitaker applied for the Park Pride Legacy Grant. With guidance from City of Atlanta Urban Planner Daniel Calvert and Project Manager Patrick Hand, the Friends of Sara J. González Park received a $100,000 grant, which is funded by the Robert W. Woodruff Foundation. A community-based steering committee was established to work with the Friends of Sara J. González Park, city officials and the project manager to create consensus on a plan for the funds. Ms. González Whitaker led the quarterly meetings which yielded four pillars for the plan that align with the park's themes around diversity, inclusion and tolerance: (1) make the park ADA-compliant; (2) ensure the playground features at least 90% equipment for children of all abilities; (3) create an open field soccer area; (4) create a legacy plaza that will reflect themes of inclusiveness and cultural diversity. In March 2018, The Sara J. González Park received the prestigious Park Pride Inspiration Award. 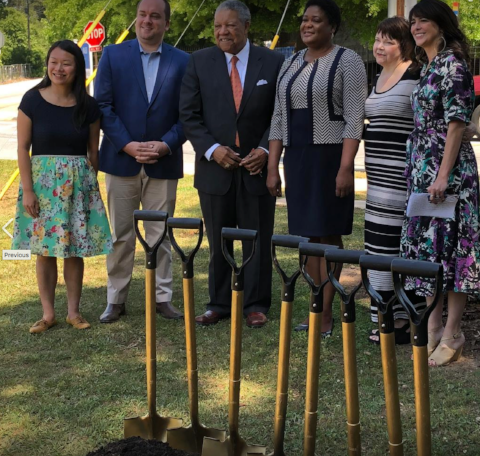 The groundbreaking for the park's enhancements took place May 2018 with a ribbon cutting attended by the neighbors, community representatives, media and city and county officials including: Atlanta City Council President Hon. Felicia A. Moore, Fulton County Commissioner Robb Pitts, District 9 Atlanta City Council Member Dustin Hillis, Commissioner of Parks and Recreation for the City Amy Phuong. In August 2018, Georgia Power Foundation generously provided the support for the build out of the first ever "Learning Nook" in an Atlanta city park. Inspired by Teacher of the Year José Manuel Osorio who held after school ESOL lessons with students at the park using his own folding metal chairs and card table, this custom fabricated "Learning Nook" will feature a shaded pergola, electricity for laptops, comfortable seating for 10-15 students and a desk with the goal of providing safe and focused educational gatherings. It will be inaugurated in December 2018. Cox Enterprises and the Trust for Public Land announced in September that park steward Isabel González Whitaker was named Atlanta’s 2018 Cox Conserves Hero as a recognition of the park’s positive community impact. The park's dedication took place in October 2018 with a keynote address by Mayor Keisha Lance Bottoms. Click here to support the park. Learn more about the Sara J. González Park here and donate here. Follow us on Facebook here.